The 28-year-old punk rocker was just 16 when she started her music career, with singles such as Complicated and Sk8r Boi written about the trials and tribulations of teenage heartbreak. But Avril told The Sun her upcoming fifth album is inspired by a lot more. She explained: "Lyrically, I talk more about other stuff these days instead of boy-bashing and break-up songs. Typically, in the past, my natural go-to in songs was boys and love. "That's what the majority of people write about, falling in love or heartbreak or partying. These are the main topics. So I pushed myself to talk about other things." 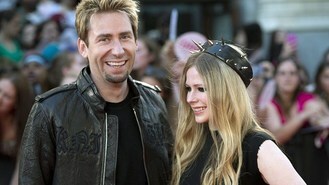 The Here's To Never Growing Up singer - who is set to marry Nickelback rocker Chad Kroeger later this year - also admitted she was very shy when she first started on the music scene, and insisted she hasn't changed that much. Avril revealed: "For me, I talk now more than I've ever done, because I'm older and more comfortable with myself. But back when I was a teenager, it was one-word answers - yes or no. "People expect me to be more extroverted and crazy, because that's how I am in my music videos - jumping around and singing. "But I'm actually much more mellow and quiet. When the music happens, I work it for the crowd. It's part of being a performer, to make sure everyone who took the time to be at the concert has the best time."